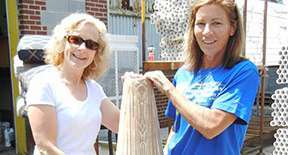 This article by Phase2Productions originally posted June 21, 2014 by Habitat for Humanity International. Learn how to spruce up a vintage table top with ceramic tiles, wood boards, grout and adhesive, in this instructional video by Bren Ische. For more great ideas watch the last video in which Bren also turns a picture of a chandelier into a working light fixture.